We’re coming up to the nine year anniversary of the death of my love. While I still mention my bereavement occasionally here, rather than define me it has become the marker of when my real life — my truly conscious life — began. His death shattered everything I knew and everything I was, and created a hole so vast I didn’t know if it would ever be filled again. But as the years passed, and I healed myself inwardly and outwardly, I have learned so much about life I don’t know if I’d want to change anything that happened. Through the unravelling and rebuilding there’s been one constant — I have been alone all this time. During the first years I was too messed up to even consider being with another soul. In the middle years I was earnestly rebuilding my life. And now, while I’m ready to venture into a relationship again, I’m trusting it will come when the time is right. For now I am still alone — and I’m content here. Yet I still remember the discomfort of Saturday nights spent alone. The endless hours with only myself for company, and that wasn’t much company at all. I remember being deeply scared of the alone in my 20s. Even an afternoon on my own could send me into a whirlwind of fears. I didn’t want to be alone — alone meant I didn’t exist. That I didn’t matter to anyone. That I was nothing. So I did everything I could to make sure I was never alone. One of the many gifts that came out of my bereavement was the opportunity to befriend the alone, once and for all. What started as excruciating has become something I deeply treasure. I actually crave being alone when I’m with others for too long. And yes I’m an introvert so this is how I recharge, but it goes so much deeper than that. Time alone is sacred to me, and something I’ll need to cultivate even when I find myself in the arms of another relationship. My alone time keeps me sane and healthy, and when I’m sane and healthy I have so much more light to share with the world. So many times I’ve heard course peeps and friends mention how being alone is hard for them. That they feel lost when their significant other is out for the night. That they’re single again for the first time in years and a weekend on their own feels terrifying. That they fill their time so they don’t feel lonely. They’re not sure how to BE alone. Then there’s the other side: my loved ones who rarely get a second to themselves. Who are demanded of and pulled in so many directions each day they fall into bed depleted to their core. 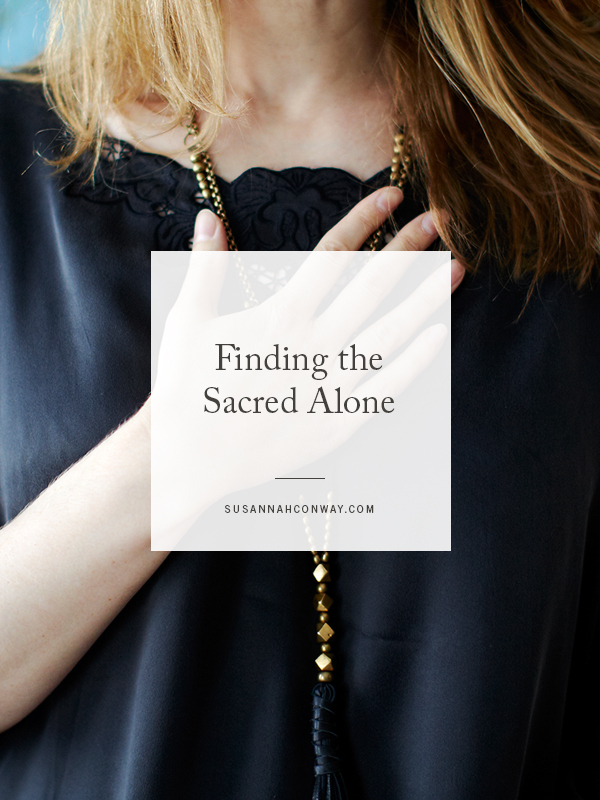 So whether you’re fearful of the alone, hungry for some pockets of time just for you, or are simply ready to cultivate a deeper connection to your internal world, I’d like to invite you to join me as we explore the Sacred Alone together. In March I’ll be leading a gentle 14-day journey into the quiet knowing space in your heart that offers refuge, wisdom and calm. Each day you’ll receive an email from me containing a short essay on the day’s theme, a downloadable MP3 audio (alternating meditations, visualisations and mindfulness exercises) and a series of powerful journal prompts to work on. Each day will build on the last, so that by the end of our 14 days together you’ll have created your own Sacred Alone practice you can build on — and extend! — going forward. You can read all the details and sign up over on this page. I really can’t wait to share this new journey with you guys! Wow Susannah, another gem <3 Congrats on this new course. It sounds absolutely divine. There is not a single part of this sentence that does not ring true for me, so Thank You for putting it so eloquently as I’ve struggled with how to define why I’ve been single for so long. Oh, this one sounds like it’s perfect for where I’m at right now. I can relate to you – my husband died suddenly aged 36 and myself 34 – i spent the next 10 years alone and although tough at first i got to know ME and I like ME. You’re so spot on–when we can learn how to BE, and BE alone, that’s a real sign of growth. I am very sorry to hear that such sadness has been a part of your story, but happy to read what it has inspired for you. What a wonderful gift to share, to help others learn to be alone, content in their own company. I had my own journey of learning how to be alone not that long ago. One thing that helped me was to think not in terms of aloneness, but of space. I realized that for anything to be created, to come into my life, I had to first make space. I took a look at what I was able to create in my for having had so much time alone in my 20s – a blog, a career I love, deep relationships with friends. And I was able to see that trying to fill space is different than being with the space, honoring its emptiness, and letting it be filled. It was one of the hardest things to do, but now I know I can shift my perspective in this way, it is very comforting. The workshop sounds amazing – I hope it helps a lot of people! I signed up for The Sacred Alone this morning – a belated birthday present to myself. My 2014 phrase: opening while maintaining center. Taking some time to nourish my center will be helpful.